On QNAP Server, How DO I Set Up FTP And Connect To It? QNAP TS-419P II is what I use to hold the backup data and share data among machines within my house. Basically, QNAP TS-419P II is a network attached storage server. It got RAIDS and host of other capabilities such as hosting a Time Machine service. Nonetheless, within this post, I post a video which talks about how to set up FTP and how to connect to FTP, on QNAP TS-419P II. Obviously, it’s not only QNAP TS-419P II which uses this particular firmware/software, therefore any other QNAP server model which uses the same firmware/software will work with the instruction within the video right after the break. Please, enjoy the video!!! How Much Are You Willing To Spend On Securing Your Data? The actual cost of making sure your data is safe (i.e., redundancy) and secure can be quite ambiguous. The ambiguousness is probably derived from the plethora of options that you can choose to go about making sure your data is safe and secure. I guess it is all depending on how you want to go about making sure your data is safe and secure. Nonetheless, if you insist on wanting to know an estimated price range for securing and backing up whatever data, I think you’re looking to spend around a little more than $1,000 or just about $0. You see, the ambiguousness can already be found from just looking at the possible cost of implementing a solution for securing and backing up data. Remember, we are speaking about implementing a solution in securing and backing up data for small business or home, therefore I think the cost of implementing this kind of data assurance solutions should not be too outrageous. Let us just go over some possible data assurance solutions to see how much you might have to spend, OK? Nonetheless, remember the cost will be ambiguous as each unique data assurance implementation might require unique data assurance solution. Requisite elements for $0 spending in securing and backing up data: Talking about spending $0 on securing and backing up data is totally possible. This scenario requires you to have a spare computer which you will not have any other use for it besides of wanting to use it as a backup machine for this specific scenario. You will definitely need to download an open source backup solution such as FreeNAS or a Linux distribution (an open source operating system which is similar to Unix type). You also need to download TrueCrypt. In the case if you want to protect database of passwords, you totally need an additional layer of protection such as password manager which is capable of encrypting its database (e.g., KeepassX, etc…). A proper home or small business network needs to be setup correctly, therefore you need to have a working router. Also, you need to know how to distribute a local, non-public, static IP address for your backup server. In the case of backing up data from outside of the network, you definitely need to know how to open up ports on your backup server and forward ports on your router. Piecing together the elements for $0 spending in securing and backing up data: So basically, the spare computer can be setup with FreeNAS or Linux distribution as a backup server. You will use TrueCrypt to encrypt data first before backing up the data onto FreeNAS or Linux server. Linux server requires your knowhow of setting up a proper service which allows you to use proper protocol to backup the data. One example of backing data to Linux would be using rsync. FreeNAS is a lot easier to deal with as it’s designed to launch NAS (Network Attached Storage) services quick and fast. In the case of digitizing saved passwords, you need a proper password manager which is capable in encrypting your passwords in an encrypted database, therefore I suggest you should try out KeepassX. To make your digitizing saved passwords even more secure, you can totally use TrueCrypt to encrypt the KeepassX database. On Linux server, you can totally download free firewall and free antivirus solution to protect your Linux server from hacks and viruses, consequently providing even more protection for your data. In the case of a FreeNAS server, at the moment I don’t think you can install firewall and antivirus programs, therefore you should make sure the firewall of the router is properly configured (i.e., to protect the FreeNAS server from intrusions). I think you might be able to use an antivirus solution on a PC to scan iSCSI drives of FreeNAS server, therefore I guess you can use an antivirus program with FreeNAS server if you have setup iSCSI drives on FreeNAS properly. Nonetheless, you must know that this is a dirty fix antivirus solution for FreeNAS server as you can only initiate an antivirus program on a PC and not on the FreeNAS server itself, limiting you to scan FreeNAS iSCSI drives only and not the entire array of physical hard drives that reside within a FreeNAS server. To backup data from abroad to your backup server at home or office, you need to rely on VPN (Virtual Private Network protocol). VPN will safely encrypt and secure the data that is in transit (i.e., utilizing the Internet to transfer data from one network location to another network location). I think you can set up VPN service on Linux server with some efforts, and this will not work if your ISP doesn’t allow VPN traffic. I’m not sure if FreeNAS supports VPN or not, but if it’s you should use it to backup data from abroad. Don’t forget to open up or port forward necessary ports for the router and the backup server to allow proper transfer of backup data, OK? Requisite elements for $1,000 spending or more in securing and backing up data: No specific recommendation on NAS (Network Attached Storage) hardware, but I have seen many NAS machine can be purchased as low as $100. 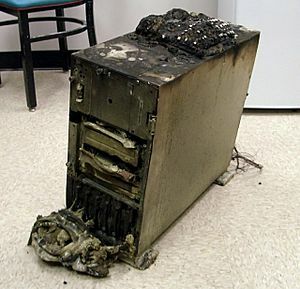 Nonetheless, I think you should choose a NAS machine that fits to your data assurance plan. Firstly, you want to make sure the NAS machine you want to buy is regularly updating its firmware to combat vulnerabilities and software errors. Usually, searching Google might reveal critical complaints on specific NAS machine that you are thinking of buying. As long you don’t find any critical complaint about a NAS machine you want to buy, then go ahead and purchase the NAS machine if you think it’s the right solution for you. Secondly, you want to know the NAS machine you are looking at is diskless or vice versa. If it’s diskless, then you should know that you have to buy hard drives to install into the NAS machine. If the NAS machine comes readily with hard drives, then you should not buy any additional hard drive. Thirdly, you might want to check how many hard drive bays the NAS machine you’re looking at has. The more hard drive bays a NAS machine has, the more RAID choices you can implement. Nonetheless, the more hard drive bays a NAS machine has, the more money you might have to spend (e.g., the cost of more bays on a NAS, the cost of more hard drives to fill up the bays). Fourthly, you want to check to see the NAS machine you’re looking at is capable of supporting all the software implementations that you have in mind (e.g., Time Machine, CIFS, VPN, NFS, FTP, rsync, etc…). Fifthly, you want to make sure the NAS machine you’re looking at is capable of doing fast data transfer in terms of reading and writing speeds. Obviously, this specification will not guarantee fast data transfer as other network and hardware bottlenecks must also be considered (e.g., slow hard drives, using slow RAID choices, slow local network, etc…). Other things you also need to consider before purchasing a NAS hardware is a NAS temperature under heavy loads, the fan noise levels, the size factor, data encryption support, antivirus capability, security measures, and so on. Piecing together the elements for $1,000 spending or more in securing and backing up data: Putting a NAS machine to work is probably easier than having to configure a FreeNAS or Linux backup solution since many NAS machines are designed with NAS users in mind. This means the NAS machine you have bought should be easily configurable, allowing you to setup proper NAS services with ease. If your NAS machine is supporting Time Machine and you have a Mac, then you should setup Time Machine on the NAS machine to allow the Mac to backup to the NAS machine whenever. If your NAS machine is supporting CIFS, NFS, rsync, FTP, iSCSI, and so on, then you can setup these protocols/services on the NAS machine to allow all major operating systems to backup the data to the NAS machine. The major operating systems I’m referring to are Linux, Mac, and Windows. Furthermore, if your NAS machine supports cloud type of service and mobile data, then you should setup these services to allow cloud type of usage and mobile data backup. Nonetheless, you should only enable the services that you need on the NAS machine, because enable way too many unnecessary services might open up unwanted vulnerabilities (i.e., allowing hackers to exploit more than one vulnerable services in a machine). Your NAS machine might be readily announced what ports you need to open on a router for network traffic to transfer data to the NAS machine correctly. Also, your NAS machine might also allow you to change default port of a service easily. To secure your data even more, you should consider the option of encrypt the NAS hard drives if the NAS machine supports encryption. I think some NAS machines might have encryption programs installed by default. If this is not possible for your NAS machine, you can use TrueCrypt to encrypt the data before such data get upload to the NAS machine. To further enhance the security of digitizing saved passwords, you can totally use KeepassX as KeepassX automatically encrypts its password database. Don’t forget to use TrueCrypt for the KeepassX database so digitizing saved passwords will be even more secure right after such passwords get backup to the NAS machine. When backing up data from abroad, you need to setup VPN service on the NAS machine so the data can be securely transit from abroad to the NAS machine that resides in a home or an office network. Some of you think backing up data to a third party backup service such as CrashPlan is a great idea, it might be so if you’re careful about encrypting the data. Backing up to the cloud is definitely an additional layer for data redundancy, therefore it’s a plus for a complete data assurance scheme. Nonetheless, when data leaves the local network and resides on someone’s else network (e.g., CrashPlan, Amazon Cloud Drive, etc…), the data is truly beyond your control. This is why when encrypting the data before allowing such data to be uploaded to the cloud is a wise data security measure. The cost of backing up data in the cloud can be varied as each cloud service will have different cloud plans. Nowadays, I have found many cloud services are quite affordable, therefore it’s up to you to find out which cloud service is best for your data assurance plan.